So I got this idea the today while browsing the EAH Wiki. Apparently, they have several pages dedicated to backgrounders and even have pictures of them. I thought it'd be neat to start a thread where we could decide which story they belong to and create names for them. Everyone can interpret the character differently, so don't be afraid to give your own spin on a backgrounder that's already been mentioned by someone else! Petra Pan, daughter of Peter Pan from Peter Pan. Pixie Bell, daughter of Tinkerbell, from Peter Pan. Jamison Hook, daughter of Captain James Hook from Peter Pan. Winter Snow, daughter of Chione, the snow goddess from Greek mythology. Lucky O'Greene, daughter of the Leprechaun from Irish folklore. Prissy Peabody, daughter of the Pea Princess from the Princess and the Pea. Brags / What did you get for Christmas? Mods, I read through the site rules and didn't see anything that says you can't post links to DeviantArt. If I missed something, though I'm 99% sure I haven't, please let me know. Thanks! I recently discovered a new form of art, and I'd like to share my creations with everyone! For those of you who don't know what photomanipulation is, it's basically pasting together images in Photoshop or a similar program to make your own, unique art without having to pick up a pencil! Which is perfect for me, because I seriously can't draw. I'm still a beginner at this, but I thought I'd leave a link to my DeviantArt page so you guys could check it out if you'd like. I'm not going to post the images directly here, because some of the stock photos I used are not permitted for use outside DeviantArt. So earlier today I was thinking about all of variety we now have with Barbie Fashionistas when it suddenly hit me that although they had made a doll with cornrows, they never made one with dreadlocks. I suddenly really want dreadlocks on a Barbie doll now, but I'm awful with doll hair, so I'll just have to wait until Mattel makes one. What other things, whether it be a certain facial feature or accessory, do you wish they would make in doll scale? Finally decided it was time to update my wants list! I can't buy at the moment, but I was just offered a job by a family member so if everything goes according to plan, I will be able to make purchases soon. I'll only purchase items from within the United States and will only pay through PayPal. Also, please keep in mind that I'll have a limited amount of money to spend on dolls, so I'm always looking for a bargain. So I recently bought a lot of thirty Bratz dolls off of eBay. I've already made over a lot of them, but then the idea to take "before and after" pictures occurred to me. I'm super busy, so I only had time to take "before" pictures, but I'll post them with "after" pictures once my schedule frees up a bit more and I have time to give these dolls the proper TLC they need. For now, show me your greatest doll transformations! So, there are a ton of new/complete dolls that I want, but since a lot of people on here sell secondhand things, I decided to just post all of the little, incomplete things that are currently on my wishlist. I'm NOT currently looking to buy as I just went on a doll buying tear, resulting in me being broke, so this is just an ongoing list. Now, on to the list! So my old thread was locked because I didn't update it....yeah, I'm pretty bad at keeping things updated. But the good news is that I'm going to the flea market tomorrow, hopefully to get some doll/doll related items, and I ordered some stuff online, so I hope to be updating this thread frequently over the next couple of days. So I bought this American Girl doll Lanie Holland back when she was released in 2010. For those of you who don't know, she was a Girl of the Year doll, meaning she would only be available until January 1, 2011. I was nine at the time, and I played super roughly with her, ruining her hair. But, fortunately, American Girl offers a "doll hospital" service where they will replace dolls' heads. 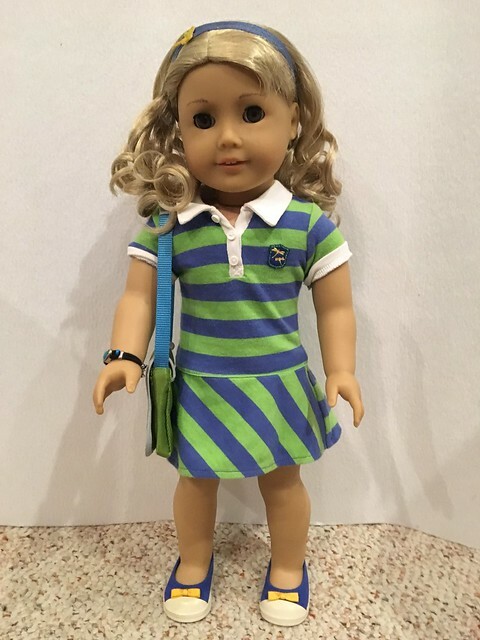 So, when my parents took me to the American Girl Store in New York as my 16th birthday present, I dropped off Lanie, they gave her a new head (lol, that sounds weird ) and she was shipped back to me. She arrived a few days ago. Look at how beautiful she is! My old thread about doll beds was locked, so I decided to make a new one. Plus, I've made a lot more beds since then. At least that's my idea now. I originally had the idea to make a foldable room I could insert into the shelves, using hinges for the foldable parts. Unfortunately, the hinges were too thick and the walls wouldn't fit. But, instead of redoing the whole thing, I just put the room on top of my shelves. But I'll be using the velcro method from now on. Well, I hope you ghouls and mansters like them! I'll post more pictures as I make more beds (I'm currently working on Meeshell's ). Monster Discussion / Never mind! So I received a package of used Monster High dolls in the mail. They came with clothes and accessories, some of which I can't figure out which dolls they belong to. I'm also having trouble identifying two dolls. I think they're Picture Day Lagoona and Gloom Beach Cleo but I can't be sure. I've included some pictures below, hopefully you guys will know. Thanks so much! I believe this is Picture Day Lagoona. Is this Gloom Beach Cleo? 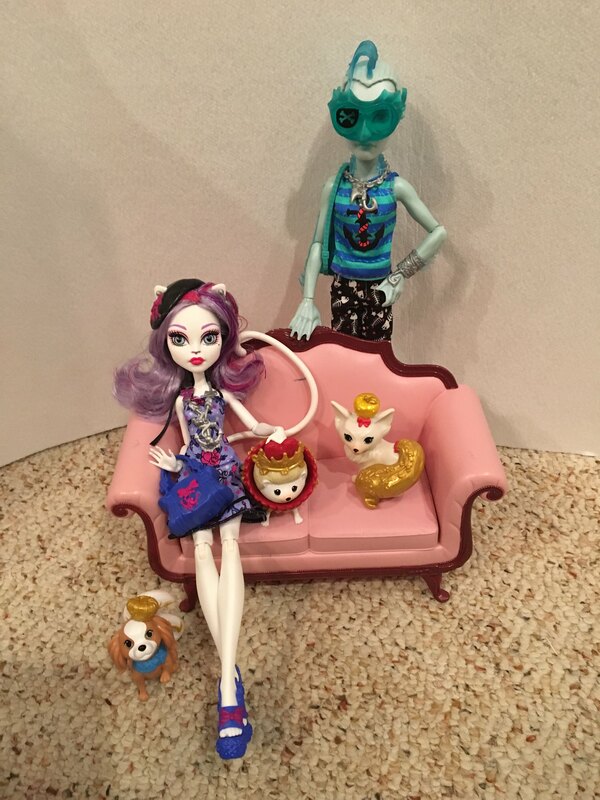 I think the dress and necklace are Cleo's, though not sure which release, and I think the shorts are Lagoona's? I have no idea who the shirt belongs to, if it even is Monster High. About time I made a post in the Wanted section! Right now, I'm not interested in buying anything, so this is kinda an ongoing list. So, here we go! Okay, that's it for now, but I assure you, this wish list will be growing in the future! 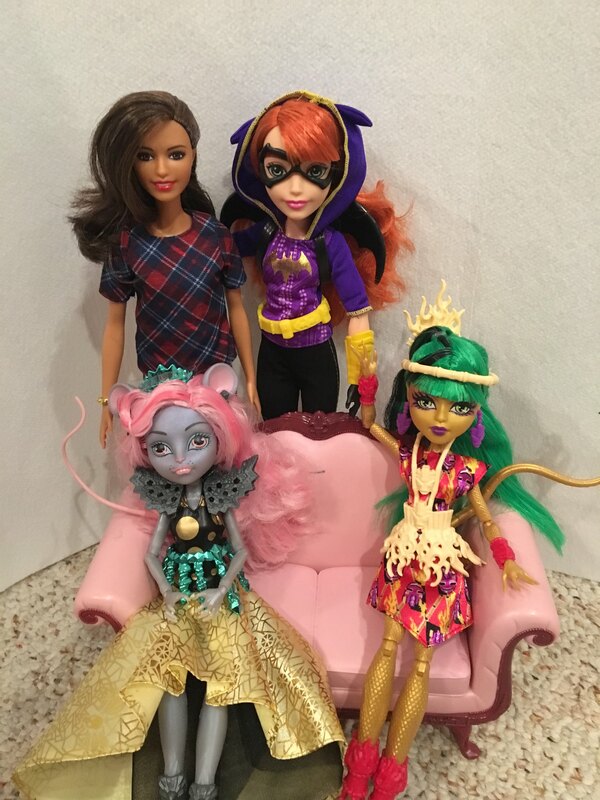 Ever After High Discussion / EAH Dolls as Godesses/Gods? -Melody would be the daughter of Apollo, the god of music. What other characters can you guys match to a god or goddess? I'm excited to see what everyone comes up with! So, about a year ago, I discovered this YouTuber: https://www.youtube.com/channel/UCJFDb15TQ9fYvwojqYqbSXQ Her name is Dolls, Toys, and Games Gal and she is AMAZING!!!! She makes homemade doll beds using Smooth Foam Blocks. So I decided to go buy some crafting supplies and make some of my own. The first bed I made was for Rosabella Beauty. But to be honest, I don't have a picture of that since the bed is away in storage and I didn't feel like dragging it out. I do have a really bad picture of it on my Instagram, though I don't know if I'm allowed to post a link to that here. Anyways, over the past year, I've made tons of doll beds. I thought I'd share a few pics. Well, I hope you ghouls and mansters like them! I'll be posting more pictures soon! Off Topic / What's the coolest thing you've ever found at a garage sale or flea market? So tell me, what is the coolest thing you've ever found at a garage sale or flea market? It doesn't even have to be Monster High related. I'm just curious to see what kind of treasures everyone here has found! I've just gotten into this garage sale and flea market thing, but the coolest thing I've probably ever found was a bunch of My Little Ponies from the early 2000s. I know its not very impressive, but as I said, I just started going to garage sales and flea markets. Anyways, each pony was $2.50 each but the woman selling them gave us a discount and I bought eight pre-loved ponies for $17. Off Topic / Are there any dolls you really want to like, but just can't? I want to like the curvy Barbie dolls, I really do. I'm not discriminating, I'm curvy myself, but I just don't like their outfits and because they're fuller-figured, I don't know if I could swap out any clothes. I also can't sew... Another doll I want to like is DC Super Hero Girls Harley Quinn. I want to love her. I really want to love her. But I just can't. Maybe it's the molded on tights...IDK. So, are there any dolls you really want to like, but just can't? Ever After High Discussion / Are the Ever After High Signatures with facial expressions legit or not? Are the Ever After High Signatures with facial expressions legit or not? I don't mean the budget ones. I mean the full on Signatures with accessories. I really want to find them so I can redress them. I usually don't redress dolls but I want a few I can redress. So I've being waiting to buy more Signatures until Mattel comes out with ones with expressions. If they're not legit, then I'm gonna go ahead and buy more Signatures. If anyone knows anything please respond. Thanks! Ever After High Discussion / Should I take my SDCC Raven Queen out of the box? Okay, so as I mentioned before I'm getting the SDCC Raven Queen. But I don't know if I should take her out of the box or not. I only want to if she comes with a stand, though. What do you guys think? And does she come with a stand? Brags / Guess What I Got For Christmas (or am going to get, anyways)?! Okay, so I was looking on eBay with my mom looking at San Diego Comic Con exclusive Raven Queen. I kept saying how much I wanted her for Christmas, and my mom said, "Since it's so obvious I'm gonna get her for you, why don't I just order it right now?" I squealed. So I'm not allowed to open her until Christmas, but I'm super-duper excited! I finally got my hands on a Comic Con doll! Yeah! I was at Marshalls the other day and saw they have Casta for only $12.99! They also had one Frights! Camera! Action! Black Carpet Lagoona for $9.99, which isn't that great a deal, but still. And...they had Fangtastic Fitness! All three of them! They were $9.99.